But wait, Erudita, don’t you self-identify as Atheist, Smug or otherwise? Well, yes, but I’m also a devotee of history’s great satirists. In my opinion, the most creative, engaging contemporary satire is Bobby Henderson’s Church of the Flying Spaghetti Monster, also called Pastafarianism. And this week some Pastafarians in Oklahoma have done something pretty cool. Even cooler is that the (ahem, Bible Belt) community didn’t react with pitchforks and torches. As part of a local Halloween parade the other day, the Oklahoma Atheists (Association, I guess?) marched alongside decidedly non-atheist groups. 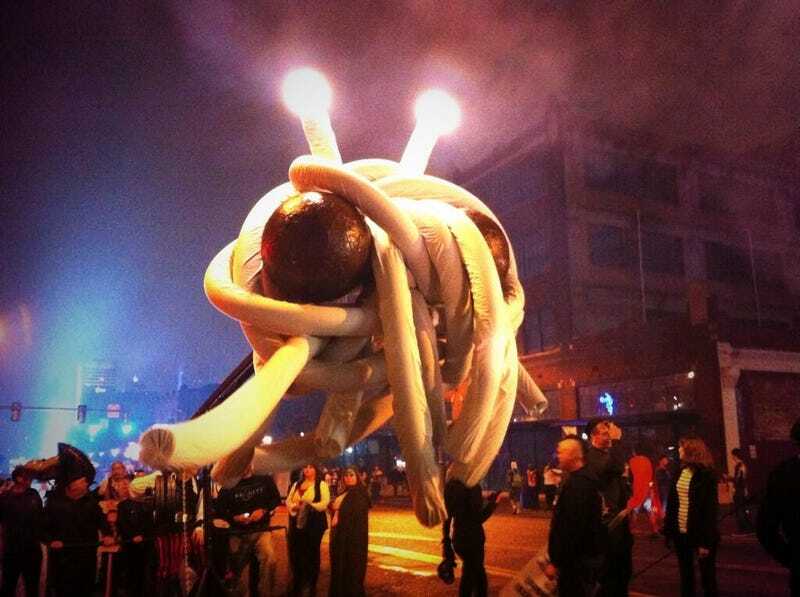 Their float was a giant effigy of His Noodliness the Flying Spaghetti Monster. They passed out candy to kids on the parade route. They only received minor heckling, and much less than the year prior. Last night, I had the privilege of marching with a motley collection of pirates, pastafarians, and assorted freethinkers down the usual parade route. I’m pleased to report that we didn’t run out of candy this time, we received much less abuse from the assembled throngs than we did last year, and significantly more positive crowd response. try to imagine this frightful incarnate god of pasta and meatballs looming and lurching down the street, powered entirely by an elite cadre of hefty godless volunteers. If your imagination thereof gives you a spine-tingling thrill, you are doing it right. Most people were just confused at first, apparently the connection between godlessness, piracy, and pasta hasn’t made its way into the mainstream yet. I would include many more photos here, but I’m afraid to inadvertently out anyone online. It is one thing to be willing to march in public, and another thing altogether to be immortalized in pixels which are easily passed around. There’s a video of the spectacle! I'm jealous - I would love to be part of something like this. To be fair, I did dress up, camp, and drink with about 95 other pirates two weekends ago, but it wasn't a pastafarian thing, just a pirate thing. Huzzah! and Praise be to His Noodliness! May you be covered in His Sauce!